National Cyber-Security Awareness Month is here once again. In that spirit we wanted to share a bit about what we are doing on Blogger to help fight malicious content, along with some tips for a safer browsing experience online. While spammers are always coming up with new tricks, the combination of Blogger’s abuse-fighting systems and the security features of modern browsers helps ensure that you’ll be able to browse through your favorite blog content with confidence. We’ve partnered with other abuse-fighting teams within Google to develop sophisticated systems for automatically detecting and quarantining nefarious content on Blogspot. Over the years, our teams have analyzed the patterns and behavior of malicious blogs and code, and with each new detection our existing algorithms are trained for better coverage in the future. As a result, we are able to catch and quarantine thousands of malicious blogs each year, and are happy to say that our overall spam levels are at an all-time low across our service. Of course, while our automated systems provide great coverage for a wide variety of abuse types, you can always let us know about suspicious blogs by reporting them directly to us via our online form. We’re also looking to you, the users, to be our eyes on the web and let us know anything that may have escaped our existing systems. We also recommend using one of the following tools to keep your browser plug-ins up to date: Google-developed SecBrowsing; Mozilla Plugin Check. For more tips on safe browsing and security on the web, check out the home of Cyber Security Awareness Month at the http://staysafeonline.org/. Sometimes returning to a nice, quiet office can be just what the doctor ordered after an exhausting trip away. And for the handful of us on the Blogger Team who just returned from BlogWorld Expo in Las Vegas, this was definitely the case. For the first time since the convention’s debut four years ago, we set up shop on the tradeshow floor with our very own Blogger-themed exhibit. Armed with demo stations, Blogger t-shirts and chip clips, and our very own bright red marshmallow couch, we spent our time showing off the latest features and talking to literally hundreds of folks about their experiences with Blogger. And we learned a lot. shaun, vardhman, chang, antin, brett, and tina on the marshmallow couch. The feedback that we got was both encouraging and enlightening, and we’re still in the process of digesting everything. First, we want to thank everyone who came by the booth to say hello, test out the new features, spend a few minutes getting interviewed, or to tell us what we could be doing better. Having so many passionate bloggers in one place to interact with was an incredible resource, from the gentleman we spoke with who has been blogging since 1995 to the fitness blogger who set up her first Blogger blog right in front of us. So once again, thanks for sharing! We’re excited about what’s in store for Blogger in the coming months, and after this trip we’re even more committed to delivering the best blog service possible. In the spirit of keeping the conversations going, feel free to send us a tweet or post on our wall if something’s on your mind. Or, if you want to give us some more detailed feedback, please let us know on our Product Ideas page. Finally, we want to thank Rick Calvert for reaching out and encouraging us to be a part of BlogWorld Expo. We hope to see you all next year! A little over a year ago, we asked all of you to speak your mind and let us know what we could do to make Blogger better. Two thousand ideas and seventy-five thousand votes later, we had quite the laundry list of feature requests and feedback to dig through. Our team took a long, hard look at the data and spent the last year cranking out as many of these features and fixes as humanly possible. ...and that’s just the beginning of the list. We’re also working on a few big improvements that we’re pretty excited about, so stay tuned as we continue to roll things out of the oven in the near future. Just as we did last year, we’re asking for your input on our Product Ideas page. As always, our ears are open to your feedback and your input has been invaluable over the years in helping us figure out where to put our time and energy. Please take a moment to vote on and submit ideas, whether specific feature requests or general service improvements. Think about new features that would make you use Blogger more, the things from other services which may be missing, and even the things which may be frustrating at times. We promise to once again take a long look at the feedback, and hope to tackle many of the top issues just as we did last time around. Thanks again in advance for all your help making Blogger the best service it can be! we released two new stats gadgets to the Blogger in Draft testing ground; after hearing your feedback and making a few tweaks, we’re happy to announce that they are both now ready for the main stage. 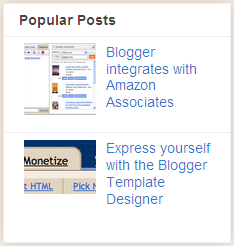 The new-and-improved Popular Posts and Blog’s Stats gadgets can be added to your blog right now from the Gadget Directory by clicking Add a gadget from the Design | Page Elements tab. The Popular Posts gadget will automatically find and display your blog’s posts that have the most pageviews. You can choose whether to display image thumbnails or post snippets in addition to the post title. 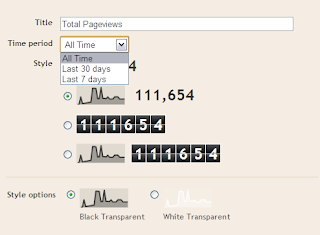 You can also choose the time window to be used for calculating pageviews and the number of posts you’d like to display. The Blog’s Stats gadget lets you show off pageview data for your blog, with a handful of configuration options that are easily controlled. 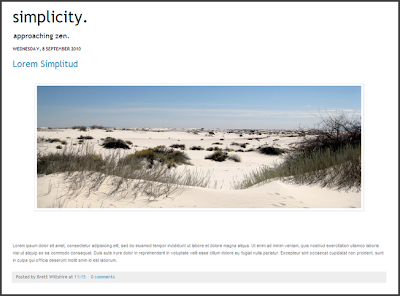 You can choose from a variety of styles and display options to suit your blog. We also provide an option to let you select the time window to be used for calculating pageviews. We hope you enjoy these new gadgets and want to thank you again for your feedback as we fine-tuned them to their current state. Last month we released two new stats gadgets to the Blogger in Draft testing ground; after hearing your feedback and making a few tweaks, we’re happy to announce that they are both now ready for the main stage. The new-and-improved Popular Posts and Blog’s Stats gadgets can be added to your blog right now from the Gadget Directory by clicking Add a gadget from the Design | Page Elements tab. When the Google Blogger team asked me to write a guest post for the Blogger Blog, I really didn’t know where to start. Today it occurred to me that the story of how I found Blogger might be a good place. I have been reading and commenting on blogs since the year 2000. I am a news and political junkie so most of the blogs I read were political. Tons of them were hosted right here on Blogger. I was amazed at the original news being reported; the insightful commentary and opinion; the incredibly moving personal stories from Milbloggers and their families and yes the crazy conspiracy theories. This Blogging thing was really incredible. Who were all these smart people? So many times I wished I could be a blogger, but I wasn’t a techie or a geek and it just seemed like it would be too difficult. Fast forward to 2005; I was in the middle of my two-hour daily commute home on the 91 freeway out of Los Angeles and listening to center right talk radio guy Hugh Hewitt. He said something that got me worked up so I called in. I don’t remember what we talked about but at the end of the conversation he said “you should start a blog.” So that night I went home and Googled “how to start a blog.” Blogger was the first result. So I clicked through and found the message you have all seen and the message that changed my life forever “Create Your Blog Now.” I had no idea how easy it was to start a blog! It only took me five minutes to do something I had been longing to do for nearly five years! Things started moving very quickly from there—someone actually read my blog. How the heck did they find me? I wondered. Top political bloggers from both sides of the aisle were linking to me. TO ME! Every political pundit I asked to interview said yes! Other bloggers were selling books on their site through Amazon. I thought to myself, I read a lot of books; I should sell the books I like on my blog. A friend helped me sign up as an Amazon Associate and I was off to the races. Then one day an Ad Network contacted me and wanted to sell ads on my blog. I had so many questions. How much money could I make blogging? How do I add things like widgets and blog rolls to my blog? Can I do audio and video posts? So I started looking for the “Blogging Tradeshow.” Being a tradeshow and conference organizer for the last 15 years I knew there was a tradeshow for every industry. I was stunned when I realized no such conference existed. I asked my blogger friends if they would ever attend the “Blogging Tradeshow.” They all said yes. I asked my tradeshow friends if they thought it was a good idea. They all said yes. 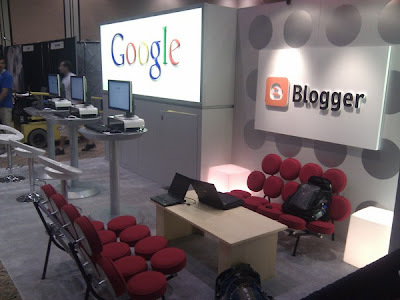 And so BlogWorld & New Media Expo was born in November of 2006. We held our first event in November of 2007 with 1,600 attendees! 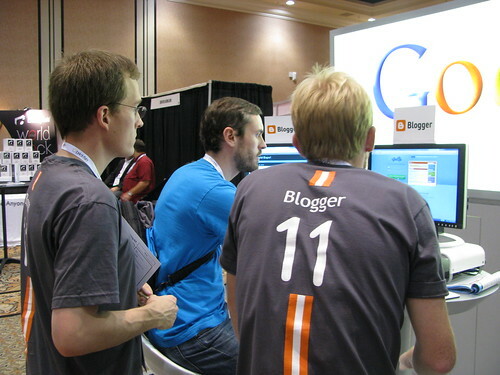 This October 14-16 at Mandalay Bay in Las Vegas we will host the fourth annual BlogWorld & New Media Expo. Over 4,000 bloggers, podcasters, YouTubers, internet radio, and TV broadcasters will be attending and things have come full circle. We are thrilled that for the first time the blog platform that changed my life, Blogger, will be exhibiting at BlogWorld. We have had folks from Blogger speak at the conference every year, and this year Product Manager Chang Kim will be speaking on “The Future of Blogging Platforms.” And now for the first time all of you can visit the Blogger booth (# 308) and ask your own questions. Or just stop by to say hi and meet the Blogger team, or like me stop by and give them a huge THANK YOU for changing your life. When it comes to design, sometimes less can be more. This is the mantra behind our newest variant Super Simple, freshly-released to the Template Designer this week. We’ve taken the original Simple variant and stripped it down to the bare essentials, putting your actual blog content front and center on the page. As with all of our variants, you are free to tweak all of the individual elements and styles to your liking. And if you are looking to design a fancy blog template from scratch, the Super Simple variant is also a great frame to build upon. 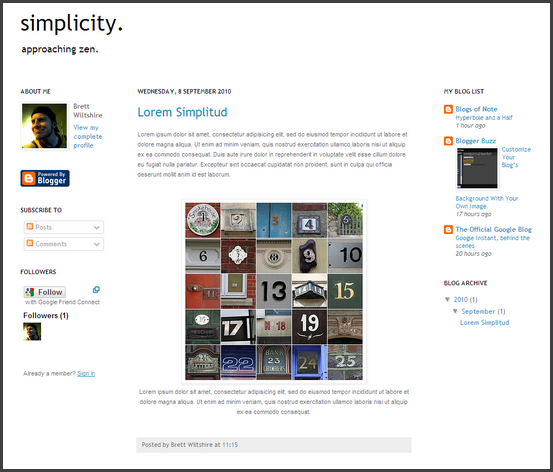 You can check out the new variant right now in the Template Designer, under the Simple category. As always, our ears are open to your feedback, so please feel free to let us know what you think. , and a huge thanks goes out to everyone who helped us celebrate! Since we were only able to attend a few parties in person (which was awesome! ), we enjoyed watching tweets, videos, and photos stream in at #bloggerfiesta. From the four hour conference for 90 people in Manila, Philippines to the three person casual rendezvous at a restaurant in Duluth, Georgia, we heard great stories from around the world about bloggers meeting each other face-to-face. Even though we’re an internet company, we know the importance of meeting in-person. It provides a great opportunity to learn from others, meet new folks and share tips. We loved that one Fiesta attendee even learned how to set up a custom domain. While we had some fun of our own last week (particularly in our Sydney office), our favorite stories are the ones you’ve shared. We’ve linked to some of our favorites below. If you have a story from your Blogger Fiesta that you would like to share with us, please send it along to blogger-fiesta@google.com. Last week we hosted Blogger’s 11th bday celebration, and a huge thanks goes out to everyone who helped us celebrate! Since we were only able to attend a few parties in person (which was awesome! ), we enjoyed watching tweets, videos, and photos stream in at #bloggerfiesta. From the four hour conference for 90 people in Manila, Philippines to the three person casual rendezvous at a restaurant in Duluth, Georgia, we heard great stories from around the world about bloggers meeting each other face-to-face. The blogosphere is a dynamic environment that changes almost as quickly as the world that we live in. And as access to information becomes more widespread and more immediate, the blogosphere is steadily closing that gap. That’s why the Blogger Team is excited to spread the word about Google’s new improvements to Realtime Search, which provide richer and fresher results than ever before. From the new Realtime Search homepage, you can search live updates, recently-published blog posts, and news from around the web in brand new ways. Now you can restrict your search to include just updates from a specific geographic region or just nearby you. You can also check out complete conversations from Twitter. You can also now set up custom alerts for Realtime updates to be sent directly to your inbox once a day or week, or as soon as the happen for instant blog post fodder. 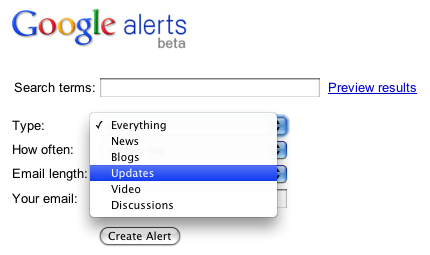 For more information about Realtime’s new features, please visit www.google.com/landing/realtime. 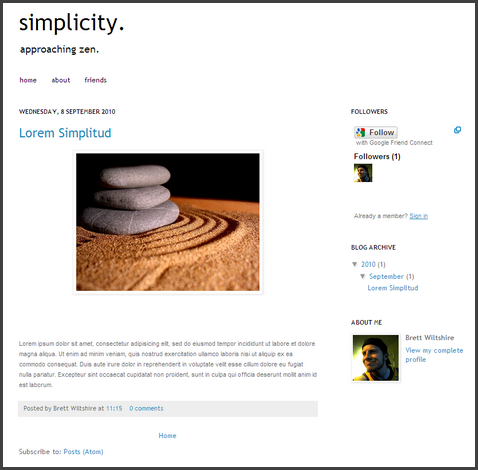 A blog is an open communications system, inviting conversations from all web users. Unfortunately, spammers have been finding their way into these conversations. To fight spam, some of you enabled moderation of all comments or required word verification or login. While somewhat effective, these checks limit real-time conversations around your blog. To address this, we’ve integrated Google’s spam filtering technologies into the Blogger comment system. Some of you will notice the new “Comments” tab. (Note: We are gradually rolling this out to all users, so some of you may not see the new Comments tab yet.) In the Comments tab, there is a Spam sub-tab that shows all the comments that are likely spam. The comments in the Spam inbox are not visible to your readers. Here, you can permanently delete spam comments by selecting them and choosing Delete. You can also mark comments as Not Spam that have been incorrectly classified as spam (what we call the “false-positives”). Choose Not Spam and the selected comments will be moved out of the spam list and will be immediately published on your blog. These feedback actions also help us better identify spam on your blog. We encourage you to occasionally check your Spam inbox to see if any non-spam comments have been marked as spam. Please note that spam filtering currently only applies to new comments. You can report any issues with our new spam system by clicking on the “Report spam filtering issues” link on the bottom of the Comments | Spam page, or by visiting this Help Forum page. We also created a place where you can see all the comments that have been published on your blog. The Comments | Published sub-tab provides a similar view as your email inbox. This view comes in handy when you want to see all of the comments on your blog in one place. With the new comments inbox, it’s easy to find new comments on old posts. In the Comments | Published sub-tab, you can select comments and mark them as spam or delete them. When you mark a comment as Spam, it will be deleted immediately from your blog. You can also Delete comments for editorial reasons or just Remove Content to leave a record of the comment. We hope that adding comment spam filtering and the new “inbox” user interface will be a good starting point toward improving the Blogger commenting system and we look forward to your feedback. Commenting is one of the most integral parts of blogging: it’s what makes blogging a conversation, not a monologue. That’s why we are pleased to announce two cool new improvements to Blogger’s comments system: much better spam filtering and the ability to view all comments on your blog in one place.
. We were excited to present you with a (small-but-mighty) bounty of gifts, a token to commemorate all of your contributions over the years. Now we’re a year older (and would like to think a bit wiser), have some great features under our belt and are ready for another celebration with you, our closest friends. For Blogger’s 11th birthday, we’re hosting the first ever Blogger global birthday party! We’ll keep it simple—we set the date, you set the parties and Meetup Everywhere will help facilitate (free of charge!). Through the wonder of Meetup Everywhere, you’ll be able to find other bloggers in your area and either join a celebration that has already been set up or start a new party local to you. The goal is to get together in-person, chat about blogging and celebrate with friends you may have otherwise only met online. Meetups can be simple, and no party is too small. Plus, we’ll be supplying each party with a download-able pack of party supplies, including makings for party hats, name tags and signs. And who knows, there may even be other treasures and surprises in store. Everything you need is on our BloggerFiesta Meetup site. To find a party near you, do a quick search on the map. To join a scheduled party, click on the I’m Interested button on the party details page. 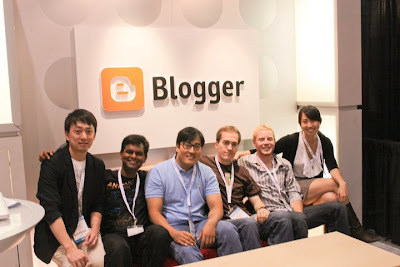 To start a new party, click on Schedule a Meetup near you at the bottom of the BloggerFiesta site. When you start or join a party, consider volunteering to be the Meetup organizer. Anyone can do it, plus you’ll get fame and glory. That gives you the ability to set the venue and time of the party. Also, don’t neglect the commenting functionality—you can use it to chat and plan with your fellow attendees prior to the party. What you do at the birthday party is completely up to you. See you on the 31st! We’ll have our party hats on. Last year, Blogger turned ten. We were excited to present you with a (small-but-mighty) bounty of gifts, a token to commemorate all of your contributions over the years.